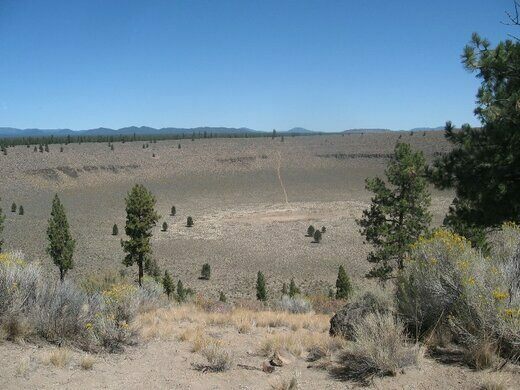 The exact origin of the mile-wide crater in the Fort Rock Basin of Lake County, central Oregon is a mystery. Thought to be of volcanic origin, rather than the result of an ancient meteor impact, it is somewhere between 13,000 and 100,000 years old. The ancient blast left a raised rim that reaches heights of 110-210 feet above the ground level, and an interior basin nearly 500 feet below it. It is thought that the crater is a maar, a depression that occurs after water reacts explosively with volcanic magma, often forming crater lakes seen elsewhere, particularly in Alaska. 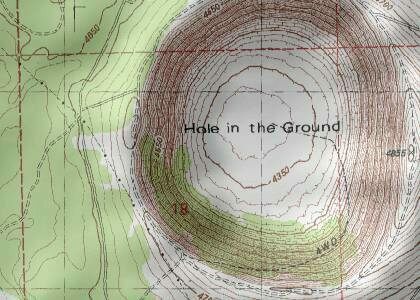 In this case, the ancient lake bed dried up, leaving only the hole. The area around Fort Rock Basin has a legacy of volcanic activity, leaving caches of obsidian and cinder cones along with old lava flows and caves. The desolate landscape is so alien that astronauts were brought to the crater for training in the 1960s. The Hole in the Ground is near another larger and more eroded maar crater known as the Big Hole. From U.S. 97, go south through the town of La Pine and head east (left) on state Highway 31 about 22 miles, then look for signs for Hole in the Ground. 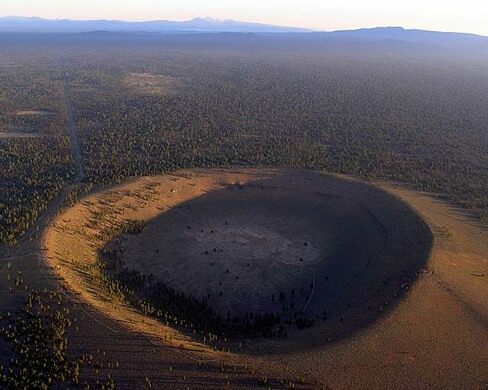 This large maar crater in Oregon is the bigger brother to Hole in the Ground. A volcanic landmark located on an Ice age lake bed. A rugged lava field dotted with molds of the ancient pines that were growing when the volcano erupted. A volcanic fissure over two miles long and up to 70 feet deep. The sunset-colored dunes of volcanic ash make taking a poor photo impossible. A winding, blood-red tunnel of hardened lava navigable by foot. A lake in the middle of the tundra of Quebec is said to be the purest freshwater lake on Earth.